While our southern neighbours might scoff at our balmy 'winter' temps, you only need to experience one soul-melting Queensland summer to understand why we embrace the moment the temp drops to low 20s. Truth is, you don’t need a massive wardrobe when winter 2017 rolls around. You just need to shop like a ninja with some carefully selected on-trend purchases (and a few investment staples) that can be mixed and matched with your existing pieces. With a little forethought, you’ll create a winter wardrobe that’ll be the envy of all your mates, and have you proudly throwing a #stylediaries tag on all your ‘grams. Not a fashion whizz? No worries! We’ve teamed up with local stylist Bec Purcell, ambassador to Queensland’s premier fashion destination, Pacific Fair Shopping Centre, to bring you seven pieces every Queenslander needs in their wardrobe this winter. You’ll be turning heads and representing a tonne of talented and emerging Aussie labels in the process. Add a little romance to your wardrobe this winter; think blush and nudes to an otherwise heavier winter palette. Pick your statement piece and go with it! Accessorise by matching back to a colour in the print. Show your love of the ‘80s through striped prints, biker jackets, ankle boots, and sheer fabrics. Don’t be afraid to shine this winter. Be it metallic sequins, gold, silver or bronze, a touch of metallic will glam up any outfit. Athleisure is key. Don’t take yourself too seriously and embrace fashion for a lifestyle on the run. Who wouldn’t want to step out dressed in the same brand as pop royalty Beyonce, Kylie, and Taylor? If you already appreciate the value of a stunning Alice McCALL playsuit, then the only item you need from their A/W2017 range is the Wildwood Jumpsuit in violet ($420). You’re guaranteed to turn heads in this statement style cut, with cute ruffles across the back and neckline, a knockout red and violet floral print, and a longer pant leg perfect for those sunny but crisp winter afternoons. Oh and P.S, Pacific Fair is home to the state’s only exclusively Alice McCALL boutique. Pretty spesh, huh? 2. The Tee | Aje. 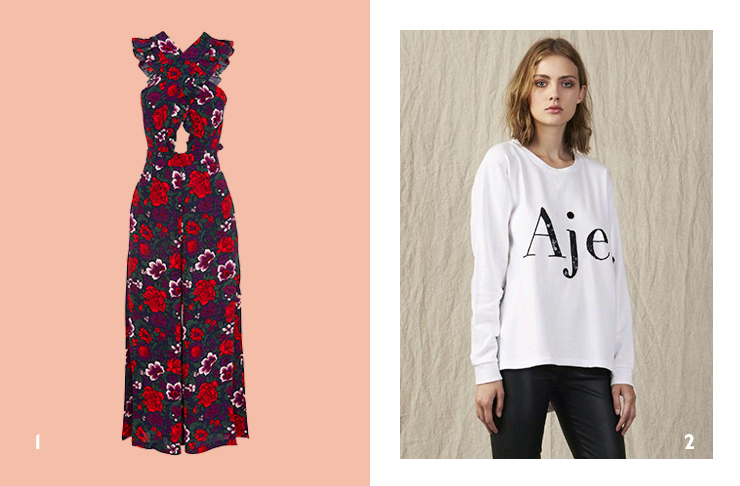 We can’t get enough of Aje.’s simple but swoon-worthy logo print tees. Exceptionally luxe, the Beatnik is a long-sleeved, black and white striped tee with a black sequined Aje. logo ($250). Dress it up with a cute pleated skirt and ankle boots, or rock out with a hip pair of thigh-hugging skinny jeans and Adidas kicks (with equal amounts of bling). Stylist Bec Purcell promises it’s worth the hefty price tag to bag a design that’ll never go out of style. This is one of those timeless investments you’ll adore so intensely, you’ll be hanging for the winter chill to arrive, just so you can retrieve your cherished shawl from its meticulously-wrapped summer storage. Kit & Ace’s Burnank Shawl ($260) is pure luxury. Lightweight, 100 per cent cashmere with a knotted fringe; it is classic, feminine, and oh-so versatile when wrapped loosely around your neck and shoulders. 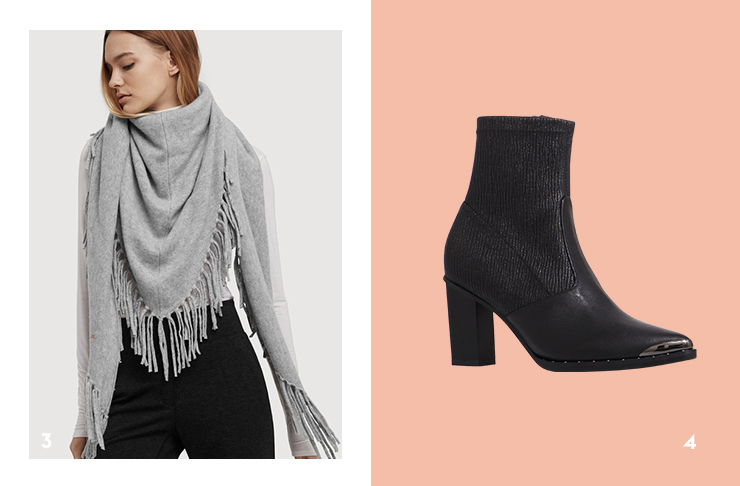 For longevity in your wardrobe, stylist Bec suggests staying neutral with the light grey. Never let winter pass by without a painstakingly selected boot purchase. Truth is, a knee-high number is outrageously impractical in our mild winter climate. Chances are said boot would see the light of day for the coldest few weeks of the season, before plunging back into the depths of your wardrobe to gather dust (again). That’s why we’re crushing on the ankle-high Tribute Stretch Boot ($399) in Ginger & Smart’s A/W17 collection; soft and stretchy for ease of slipping into, with a sculpted leather toe, and cool studding. Mix and match with any outfit and you’re good to go. So, this is where you’re going to need to pull out that birthday money—all of it. At some point in every fashionista’s life they’ll drop the cost of a week-long holiday on a lifelong investment piece—the leather jacket. What is Pacific Fair stylist Bec Purcell’s pick for A/W17? 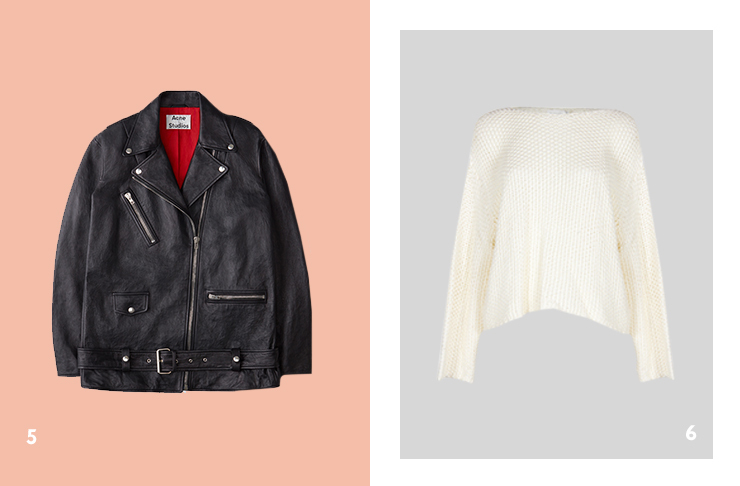 The Acne Studios Myrtle leather jacket (*cough* $3,200) is luring you inside Harrolds’ luxe fashion boutique. This lamb leather, oversized jacket is so timeless you’ll be passing it down to your children. If there’s one piece you should splash out on this winter, one that will stay by your side for the entire season, it would have to be the romantic Cleveland sweater by Flannel ($249). Go neutral with the cream, 100 percent cotton. When a jacket is too heavy, a cosy and versatile sweater is all you need to survive the Queensland winter. So effortless, yet so sassy, it’s difficult not to fall in love with the Leema tie neck dress ($575) by Australian brand, Incu. Bold animal print, breezy 100 percent silk, this purchase will take you right through to spring; dress it up with accessories or down with flats. And if the South East Queensland weather decides to turn sour, have a leather jacket on hand to tie in the mix. You’ve done all that planning, you might as well frock up and start your shopping expedition off on the right heel. Cruise up and feel like a rock star with stress-free valet parking for a very easy $10. This article is proudly sponsored by our (very stylish) friends at Pacific Fair Shopping Centre. Thank you for supporting the sponsors who make The Urban List possible. For more information on our editorial policy, click here.